Web Designers – Help wanted! 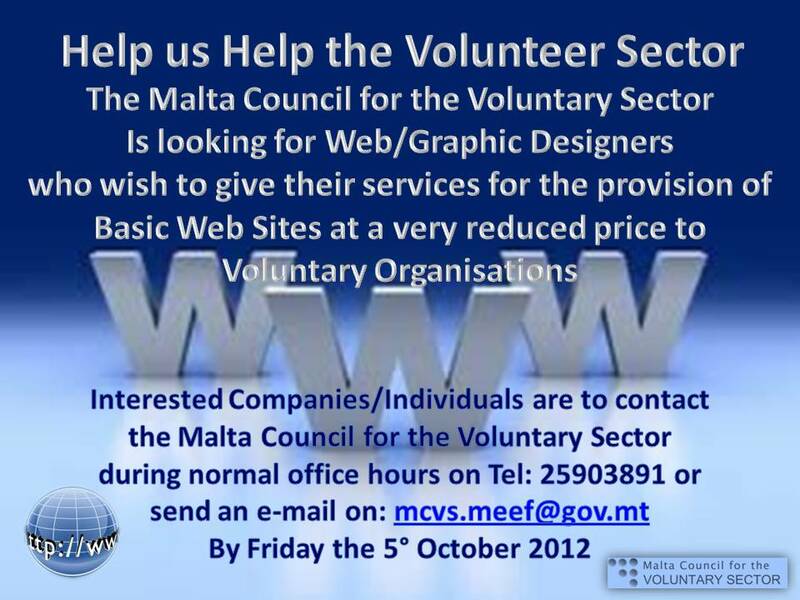 The Malta Council for the Voluntary Sector(MCVS) is looking for Web/Graphic Designers who wish to give their services for the provision of Basic Web Sites at a very reduced price to Voluntary Organisations. We also encourage Companies possibly to do one or more web designs for free as part of their corporate social responsibilities. The idea behind this scheme is to support Voluntary Organisations enrolled with the Commissioner for Voluntary Organisations and who do not have their own web site. Those companies/individuals that accept to enter in this scheme be included in a list and promoted on the MCVS web site with Voluntary Organisations. The Voluntary Organisations may then contact the Company through the MCVS and an agreement according to the submitted price be drawn up between the Company and the VO. Interested Companies/Individuals are to contact the Malta Council for the Voluntary Sector during normal office hours on Tel: 25903891 or send an e-mail on: mcvs.meef@gov.mt by Friday the 5° October 2012. We thank you beforehand for your support to Voluntary Organisations.